One Witty Ditty For Your Memory of Theology: Who will I be in union with that will make me bear Fruit of the Spirit? Sometimes people think they will only become godly and lovely once they meet someone they love and they are in a relationship with that individual. 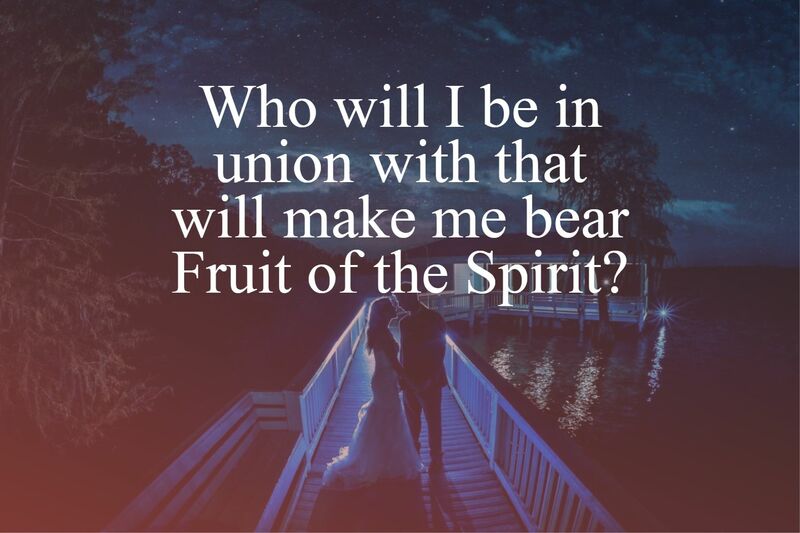 But is it union with someone in courtship or marriage that makes us bear the fruit of the Spirit? This entry was posted on Friday, December 21st, 2018 at 2:03 pm	and tagged with Christian bloggers, Domain for Truth blog, fruit of the Spirit, reblogs, union with Christ and posted in religion. You can follow any responses to this entry through the RSS 2.0 feed. Thanks for sharing this post; I’ll be reading your blog super late tonight given ministry obligation but wanted to drop by with a thanks! This got 46 views on my blog today. Your blog must be a real powerhouse–or does that only happen when you go to Twitter? I have Twitter, but someone manages it for me and I don’t know anything about how it works. You know its funny you said that; I just got suspended for a few hours from Twitter. My account activity is pretty bland, nothing radical. But my latest post on the lies spewed by the media against those Catholic boys led Twitter to automatically suspend my account and I just got it activated by revealing more personal information to them. Fascists. This really has to stop. We need some anti-trust action against the social media giants. They’ve gotten too big for their britches. We must, for the survival of our country and our way of life, totally and for all time defeat liberals and their Democrat Party. By “liberals” I mean Stalinist wannabes. These Marxists have no “liberal” spirit whatsoever. It was all your fault, though. Imagine! Citing the fact–facts are hate speech–that the Marines don’t have rangers. No wonder they suspended you. Facts don’t matter! According to Alexandria Ocasio-Cortez. Wouldn’t you love to see a debate between her and Hank Johnson? IMO, it’s the Mark of the Beast. Go along with the Godless agenda, and they love you. Resist it and they will wreak vengeance upon you.